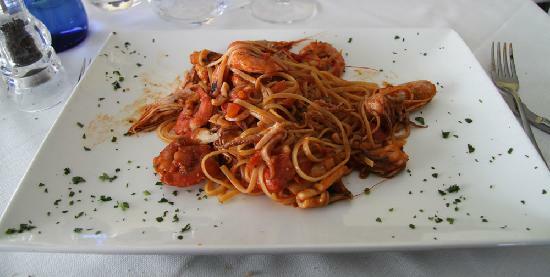 The spaghetti with calamari and shrimp are a quick meal to prepare, the only task a bit 'complex is to clean the fish. 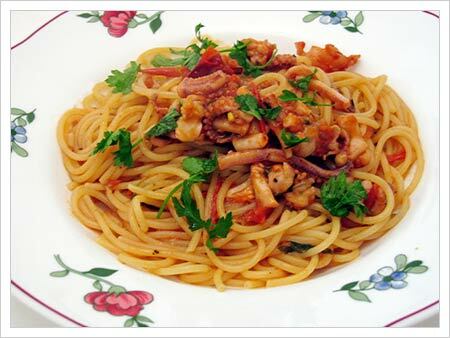 Ingredients for 4 persons - 350 g of spaghetti - 200g-200 g of squid shrimp - 1 clove garlic - 1 / 2 cup dry white wine - 1 / 2 cup vegetable stock or fish - a knob of butter - 2 tablespoons olive oil - salt, pepper PREPARATION Clean the squid: Cut the bags to thin rings and tentacles into pieces. Slips gently shrimp. Prepare a mixture with garlic, salt, parsley, pepper and oil. In a pan, melt the butter and brown the shrimp. Add wine, simply evaporate the alcohol and bring the squid. Pour the broth, pour the mixture prepared with a lid and cook over a medium flame for about 15-20 minutes. 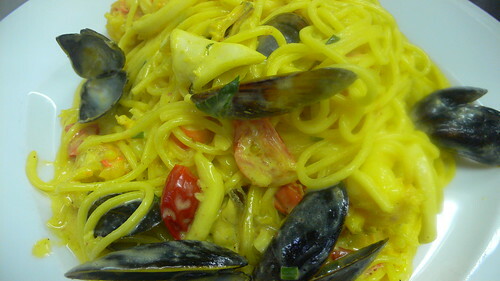 Meanwhile, cook the spaghetti in salted water, drain it al dente, uniscili fish to the casserole, mix well and serve.